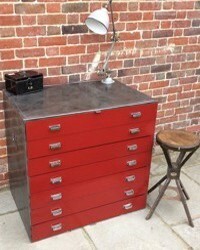 Mayfly Vintage is an online industrial and vintage furniture and homeware shop based in Hampshire, England. Our style is an eclectic mix from the industrial look to old school furniture and French vintage. Mayfly Vintage was established after years of my husband and I collecting vintage pieces of furniture and homeware in the UK and across Europe. We started off selling at the monthly Winchester Vintage Market and now exhibit at antiques fairs in the South of England alongside our online store. The majority of our pieces are one-off unique items so our stock changes all the time. We hope you enjoy what you see and if you like our style and there is a particular item which you can’t see please do contact us and we may be able to source it for you. MAYFLY VINTAGE own terms and conditions can be read here. Consumer Contracts Regulations apply. If a Member is based in Europe, you may need to confirm with them their specific purchase and returns policies. However Distance Selling Regulations apply througout Europe as far as The Hoarde is aware. For the avoidance of doubt 'Dealer' and 'Member' are the same.